Explanation: Auroras can make spectacular sights. Photographed above, flowing green auroras help the Moon illuminate the serene Portage Lake and the snowy Chugach Mountains near Anchorage, Alaska, USA. 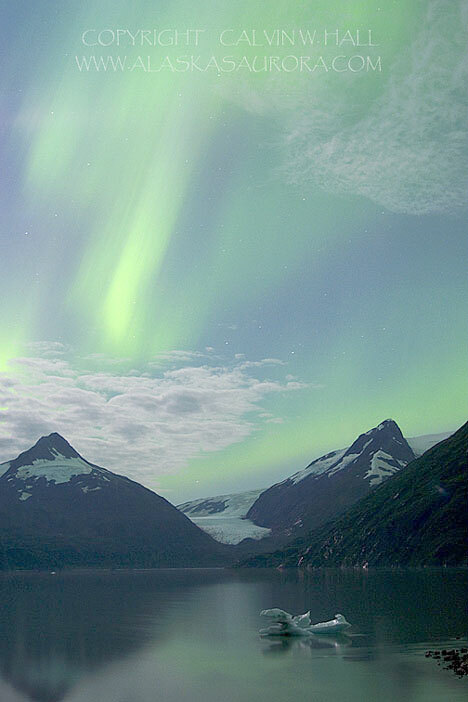 Although auroras might first appear to be moonlit clouds, they only add light to the sky and do not block background stars from view. Called northern lights in the northern hemisphere, auroras are caused by charged particles streaming out from the Sun entering the Earth's atmosphere. If viewed from space, auroras can be seen to glow in X-ray light as well. Predictable auroras likely occur a few days after a powerful magnetic event has been seen on the Sun.